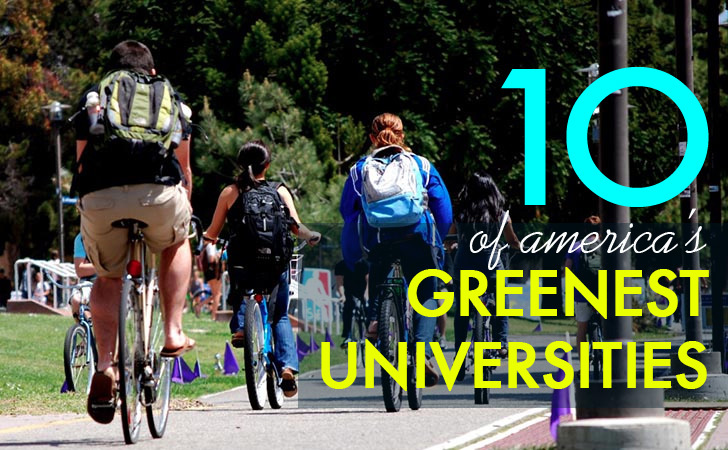 2013's Top 10 Greenest Universities in the U.S. Universities across the U.S. are having a tremendous impact on the greening of our planet by leading by example with green campus operations, by producing groundbreaking sustainability research, and by inculcating future generations with environmental responsibility. Sierra Club's magazine Sierra has been recognizing the greenest of U.S. universities for the past 7 years. Last week, they announced the top 162 "Cool Schools" in the country. Their criteria was holistic and took into account everything from "what’s served in dining halls to what’s taught in lecture halls to what’s powering the dorms". In honor of the first day of school—at least for most over here in the US—we're highlighting the distinguished top 10 universities in the "Cool Schools" rankings below. Forty-four of the buildings on campus at UC Santa Barbara are LEED certified and 47% of academic departments offer a class about sustainability, totaling 321 classes, with 217 faculty members who do eco-research. Fifty percent of the food served at UC Santa Barbara is local and 75% of waste is diverted from the landfill through recycling and composting, with a goal to make it 100% by 2020. 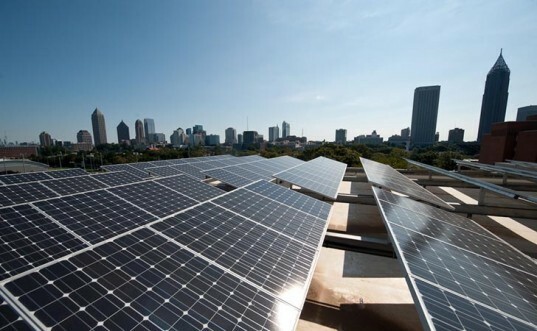 Since the 1990s, the university has lowered its grid electricity demand by a third (thanks to 10 on-campus photovoltaic systems), lowered water use by a quarter, and lowered food waste by almost 35%. 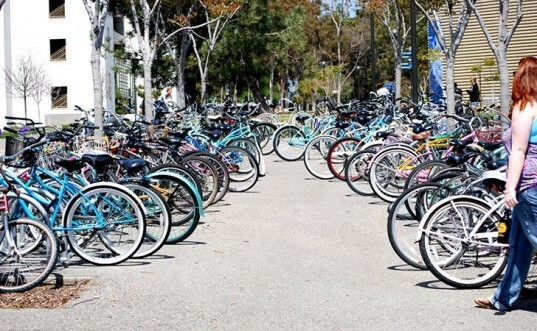 There are more than 10,000 bicycle parking spaces on campus to accommodate 10 miles of bike paths. That’s a good thing too since a whopping 94% of students take alternative means of transportation to get to school. The American University in Washington D.C. aims to be carbon neutral by 2020. Thirty buildings on campus are on track for LEED certification and the campus boasts of a 27-kilowatt solar array, along with D.C.’s biggest solar hot water system. The university also has a device called the Vegawatt, which turns cold cooking oil into electricity. AU is two-thirds of the way to achieving their goal of 100% waste diversion from the landfill thanks to a campus-wide composting program, trayless dining, which has reduced food waste by a third, and a quarterly e-waste drive. In fact, the university won last year’s national Recycle Mania competition. The institution also holds an annual Campus Beautification Day, a springtime tradition that brings the AU community together to make the campus greener. Georgia Tech, located in Atlanta, was named one of the “best places for commuters” for its range of eco-friendly transit options including carpooling, mass transit, and natural gas-powered buses that move more than 2 million riders a year. Plus, the 440-acre school was named Tree Campus USA for its 25% tree canopy cover. But despite their verdant forest, water usage has remained the same since 2001, which is impressive because the school has grown to twice the size since then. Every structure built since 2008 is LEED certified and a 1.4 million gallon storm water cistern on campus helps to conserve water. The campus has been recycling since 1996, diverting 600 tons of waste from the landfill every year! Over the last 5 years, Stanford has raised more than $430 million for environment and sustainability initiatives. The university is building a new energy facility that’s expected to halve the 8,180-acre campus’s CO2 emissions and cut its water use by almost a fifth. As many as 130 professors spanning 40 departments teach 700-plus sustainability-related classes and about 30 student clubs on campus are focused on sustainability. The campus currently manages to divert 66% of its waste from the landfill with a goal of zero waste. Green Mountain College may be a tiny college in Poultney, Vermont, but it’s big on sustainability, describing itself as a “liberal arts college emphasizing environmental sustainability”. The college was one of the first universities in the US to achieve climate neutrality. It has a $5.8 million biomass plant that burns locally sourced wood chips to heat 85% and power 20% of the campus’ two dozen buildings. Since 2006, the college has sourced 1.2 million kWh per year from cows. Students visit local farms to learn about the bovine methane-generating process and are required to take a 37-credit environmental curriculum. Cornell offers 340 sustainability classes, spanning almost every department and it’s one of the only universities where you can minor in climate change. The university has pledged to become a net-zero carbon campus by 2050. Over the past two years, its greenhouse gas emissions have dropped by 25%, and over the next five, $45 million is slotted to go toward energy conservations projects. 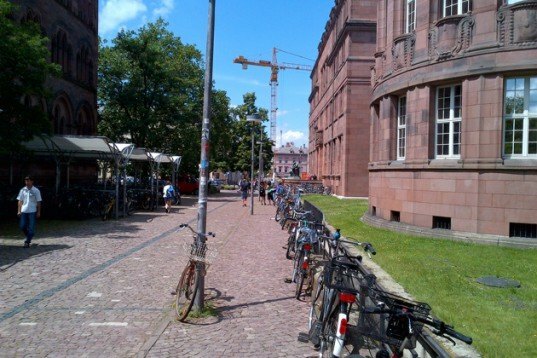 The university has already added more than a million square feet of new construction without needing to use any additional power. But the 2,300-acre campus is more renown for its conservation of open space, including 2 stunning gorges, a 35-acre botanical garden, and a 100-acre arboretum. UC Davis was last year’s Sierra’s Cool Schools winner. As an agricultural-education powerhouse, the university produces research that helps shape California’s water laws and pushes new farming practices into mainstream farming. UC Davis is also home to the West Village, a neighborhood of students, and staff and America’s biggest planned zero-net energy community. The campus’ climate action plan has already cut campus emissions to below year 2000 levels. And the university diverts more than 60% of its waste from the landfill through recycling, composting and reuse, with a goal of getting to 100% by 2020. UC Irvine has saved 20 million kWh of electricity per year since 2009 thanks to its 19-mW cogeneration facility and other energy-preserving projects like solar photovoltaics that generate enough power to run 500 homes a year. The 1,475-acre campus also boasts of a 16-acre botanical garden and has a mandate that all new buildings must be certified at least LEED Silver. 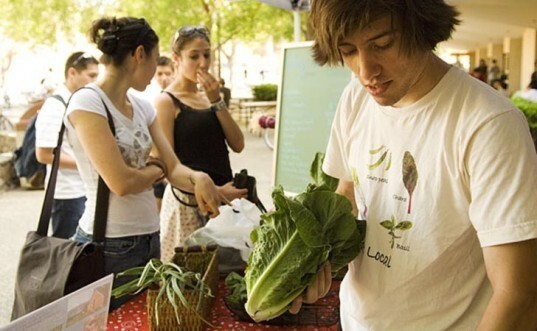 A dozen student clubs focus on the environment and the campus encourages green living by promoting things like “Meatless Mondays”. Since 2008, Dickinson College in Carlisle, Pennsylvania has bought enough wind power to offset all its energy needs. Since 2006, students have been collecting grease from local restaurants and turning it into biodiesel for the campus’s vehicle fleet. The school is planning to achieve net-zero emissions by 2020. The on-campus cafeterias serve student-grown produce and new buildings are built to the LEED Gold standards. And the college has managed to reduce its paper usage by 60% over the past 4 years. Sierra picked UConn as this year’s top green university partly because it offers almost 600 sustainability classes taught by some of the most respected sustainability experts in the world. Forty percent of the research faculty produces original academic work that benefits the environment. Since 2005, the main campus in Storrs, Connecticut, has cut its water use by 15%. And over the past two years, 13 of its buildings have been retrofitted to curb a whopping 2,640 tons of CO2 emissions per year. In their trayless dining, 30% of the options are vegetarian and more than a quarter of the food is processed within 100 miles, with much of it coming from right on campus. Honey is sourced from the university’s apiaries, fresh eggs come from the agricultural department, and seasonal produce comes from student-run gardens. Plus, the school’s Forest Committee tends to more than 2,000 acres of open space. It is good to see that the list wasn't (completely) dominated by California schools. It is important that sustainability is practiced at more universities across the country. Hopefully the next few years will see a brand new set of top 10 schools that are pushing the envelope. Forty-four of the buildings on campus at UC Santa Barbara are LEED certified and 47% of academic departments offer a class about sustainability, totaling 321 classes, with 217 faculty members who do eco-research. Fifty percent of the food served at UC Santa Barbara is local and 75% of waste is diverted from the landfill through recycling and composting, with a goal to make it 100% by 2020. Since the 1990s, the university has lowered its grid electricity demand by a third (thanks to 10 on-campus photovoltaic systems), lowered water use by a quarter and lowered food waste by almost 35%. 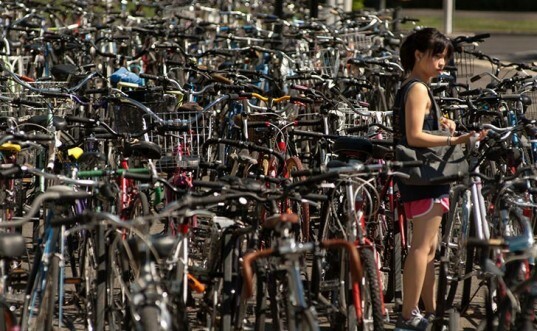 There are more than 10,000 bicycle parking spaces on campus to accommodate 10 miles of bike paths. That's a good thing too since a whopping 94% of students take alternative means of transportation to get to school. 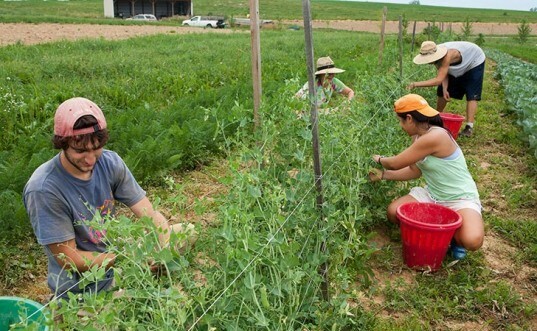 The American University in Washington D.C. aims to be carbon neutral by 2020. Thirty buildings on campus are on track for LEED certification and the campus boasts of a 27-kilowatt solar array, along with D.C.'s biggest solar hot water system. The university also has a device called the Vegawatt, which turns cold cooking oil into electricity. AU is two-thirds of the way to achieving their goal of 100% waste diversion from the landfill thanks to a campus-wide composting program, trayless dining, which has reduced food waste by a third, and a quarterly e-waste drive. In fact, the university won last year's national Recycle Mania competition. The institution also holds an annual Campus Beautification Day, a springtime tradition that brings the AU community together to make the campus greener. Georgia Tech located in Atlanta, was named one of the "best places for commuters" for its range of eco-friendly transit options including car pooling, mass transit and natural gas-powered buses that move more than 2 million riders a year. Plus, the 440-acre school was named Tree Campus USA for its 25% tree canopy cover. But despite their verdant forest, water usage has remained the same since 2001, which is impressive because the school has grown to twice the size since then. Every structure built since 2008 is LEED certified and a 1.4 million gallon storm water cistern on campus helps to conserve water. The campus has been recycling since 1996, diverting 600 tons of waste from the landfill every year! Over the last 5 years, Stanford has raised more than $430 million for environment and sustainability initiatives. The university is building a new energy facility that's expected to halve the 8,180-acre campus's CO2 emissions and cut its water use by almost a fifth. As many as 130 professors spanning 40 departments teach 700-plus sustainability-related classes and about 30 student clubs on campus are focused on sustainability. The campus currently manages to divert 66% of its waste from the landfill with a goal of zero waste. 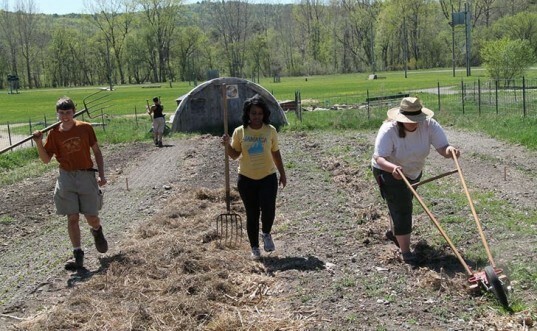 Green Mountain College may be a tiny college in Poultney, Vermont, but it's big on sustainability, describing itself as a "liberal arts college emphasizing environmental sustainability". The college was one of the first universities in the US to achieve climate neutrality. It has a $5.8 million biomass plant that burns locally sourced wood chips to heat 85% and power 20% of the campus's two dozen buildings. Since 2006, the college has sourced 1.2 million kWh per year from cows. Students visit local farms to learn about the bovine methane-generating process and are required to take a 37-credit environmental curriculum. Cornell offers 340 sustainability classes, spanning almost every department and it's one of the only universities where you can minor in climate change. The university has pledged to become a net-zero carbon campus by 2050. Over the past two years, its greenhouse gas emissions have dropped by 25%, and over the next five, $45 million is slotted to go toward energy conservations projects. The university has already added more than a million square feet of new construction without needing to use any additional power. But the 2,300-acre campus is more renown for its conservation of open space, including 2 stunning gorges, a 35-acre botanical garden and a 100-acre arboretum. UC Davis was last year's Sierra's Cool Schools winner. As an agricultural-education powerhouse, the university produces research that helps shape California's water laws and pushes new farming practices into mainstream farming. UC Davis is also home to the West Village, a neighborhood of students and staff and America's biggest planned zero-net energy community. The campus's climate action plan has already cut campus emissions to below year 2000 levels. 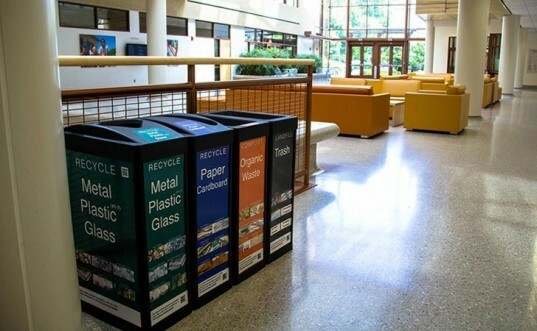 And the university diverts more than 60% of its waste from the landfill through recycling, composting and reuse, with a goal of getting to 100% by 2020. UC Irvine has saved 20 million kWh of electricity per year since 2009 thanks to its 19-mW cogeneration facility and other energy-preserving projects like solar photovoltaics that generate enough power to run 500 homes a year. The 1,475-acre campus also boasts of a 16-acre botanical garden and has a mandate that all new buildings must be certified at least LEED Silver. A dozen student clubs focus on the environment and the campus encourages green living by promoting things like "Meatless Mondays". Since 2008, Dickinson College in Carlisle, Pennsylvania has bought enough wind power to offset all its energy needs. Since 2006, students have been collecting grease from local restaurants and turning it into biodiesel for the campus's vehicle fleet. The school is planning to achieve net-zero emissions by 2020. The on-campus cafeterias serve student-grown produce and new buildings are built to the LEED Gold standards. And the college has managed to reduce its paper usage by 60% over the past 4 years. Sierra picked UConn as this year's top green university partly because it offers almost 600 sustainability classes taught by some of the most respected sustainability experts in the world. Forty percent of the research faculty produces original academic work that benefits the environment. Since 2005, the main campus in Storrs, Connecticut, has cut its water use by 15%. And over the past two years, 13 of its buildings have been retrofitted to curb a whopping 2,640 tons of CO2 emissions per year. In their trayless dining, 30% of the options are vegetarian and more than a quarter of the food is processed within 100 miles, with much of it coming from right on campus. Honey is sourced from the university's apiaries, fresh eggs come from the agricultural department and seasonal produce comes from student-run gardens. Plus, the school's Forest Committee tends to more than 2,000 acres of open space.